Waiting is hard, hard, hard. Breathe will be out from Algonquin in 2010, Spring. So, while I wait, so I won't chew off my own hands in anxiety, I am writing a script for the novel and I am 200 pages into a new novel, with another on the back burner, and I have hit a snag. Okay, more than a snag. A dark-night-of-the-soul. I have that wonderful John Irving quote--see a few blog posts below--on my wall, to help me and I have just discovered that a character I thought was going to be gone early on, needs to come back. But how to do it so it feels real??? Feed Me Anthology is out! I am thrilled that Harriet Brown's wonderful anthology, about women, power and food, Feed Me is now out. My essay, The Grief Diet, which was called "chilling" and singled out by Booklist and PW, is in it. (Psst, all you have to do is google and you can read it online!) But the whole anthology is wonderful and important (and paperback for those of you worried about money) and all about the relationship between toxic control and diet and food. I am struggling with my novel, working so hard on my scripts that my fingers feel like they are about to bleed. I now know and like a few producers, but I want something to happen! Is it easier to write in the cold than the dead of summer? Sometimes when it's so frigid outside, being inside with work you love, videos, music, food and people you love sounds perfect. But we have been feeling housebound of late, so today we all bundled up in scarves and hats and gloves and romped around the freezing cold city. I had a blast humiliating myself at a Karaoke place in the village, then we had Ethiopian food in the east village, then cupcakes in the west Village and now we are home. But is is hard. You kill yourself trying to get a movie made and it falls apart days before principal photography. You rip out your heart writing a novel and spend most of the time feeling dizzy and nauseous because you are sure you have no talent. You adore people and they vanish and if they don't, you worry that they might vanish or get sick or you worry that you may get sick and this time there may be no way out. You worry about the universe and just the thought that everything came from an incredibly dense tiny speck keeps you up night. Of course you need the love, and the hope, the magic and the joy, but sometimes hearing that someone is brave and honest enough to admit that they are having a rough time of it (and your being able to help, or not being able to help--just being able to listen) grounds you in a way that participating in pure joy sometimes does not. It's real. It's honest. It's acknowledging the bad as well as the good. 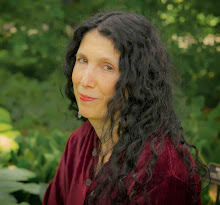 So I am giving yet another shout out to Dispatches from Utopia (when I first started reading it, it was called Dogs Steal Yarn) , Cari Luna's blog, which I greatly admire. Cari is an uber-talented writer (we share and are both devoted to the same agent), and her blog is honest to the point of being raw. I think it takes a lot of bravery to bare yourself the way Cari does in print, and I think that is what makes Cari such a superlative writer. So here is to the joy (the yin!) and to the sorrow (the yang!) and to appreciating and understanding and being brave about both. I'm off to watch the inauguration at my son's school! Excited kids! Parents! Food! Jessica Keener sent me this quote, passed on to her by wonderful novelist Tish Cohen, and I love it so much, I am thinking of inscribing it on my head. "If you don't feel you are possibly on the edge of humiliating yourself, of losing control of the whole thing, then what you're doing probably isn't very vital. If you don't feel that you are writing somewhat over your head,why do it? If you don't have some doubt of your authority to tell this story, then you're not trying to tell enough." John Irving. Yes, it's time to talk about giant squid again, my symbol for all that is terrifying. I am glued to the TV. I keep expecting Bush to declare martial law and make himself king forever so my anxiety level is a tad high. I cannot wait for Obama to be president! I prefer the quantum physics rational for time: there is none. I am still struggling with fear of writing. I'm terrified to dip into my novel again. I don't know whether it is fear that it won't continue to progress, or it won't be any good or I will reach that point where I am hysterical and panicked. I have 180 pages done! Or maybe it is fear of going into those dark, deep places I need to go to do this novel. Sometimes I think it is fear of the publishing world, fear of that look on a face which makes you stop telling your story in mid word. Fear that my premise is too different, too difficult, too far fetched. (But I WANT to write this story.) Last night I overcame my angst and wrote 800 words in a burst of fever and I felt so much better, so high. But today, here it is again and I don't know why. I don't have this problem with scripts, probably because I feel that I've only dipped my toes into the film world so I don't have the sense to worry about hyperthermia and sharks and giant squids yet. I know what I need to do. I need to shut up, hunker down, shut out the voices and push away the giant squids and write. We in the arts need this and the country needs the arts--now more than ever. The plus marks (and the peril) of the freelance life is that it is always feast or famine. Right now it is feast, but I am overwhelmed and coming up for air to say: I am overwhelmed. I can't even get up for lunch but have to nibble at my desk! I want/need to hunker down and do my novel and my script, but I have book columns and reviews and manuscript consulting and my class and editing (all jobs I love) and right now, in this economy, I am so very grateful for it all. I'll carve out time for my writing, I will, I will! Most of all, I'm grateful I don't have to go work in a corporate office anymore and try to find something coherent to wear and not have to feel like an outcast. So how do others who freelance/write handle this? It is the never-ending question for me, and for many of my friends. The deadline panic, though, is not pretty. 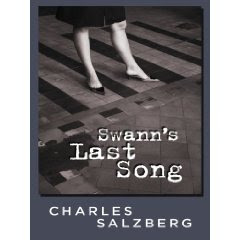 Swann's Last Song by Charles Salzberg boasts a soulful poetry-spouting gumshoe and a gritty NYC backdrop. I loved the book so much I asked Charles if I could bombard him with questions. Thanks, Charles! What I loved so much about this book, beside the story itself and the terrific portrait of my beloved NYC, was the voice--this guy quotes poetry even as he's looking for the net cash flow. How did that voice, and this quirky character come about? Thirty years or so ago, I began reading the classic detective writers like Raymond Chandler, Dashiell Hammet, Ross MacDonald, a well as the noir pulp writers like Jim Thompson. They were not only well-written, but tightly plotted, which appealed to me, since I was writing mostly character driven fiction. I decided to try my hand at it, but with a twist. I saw that basically, the world of the detective was very well-ordered and theological in nature. He (or she) would follow the clues and then solve the crime. But what if the world wasn't so ordered--what if it were chaotic and unpredictable? And so, I decided to write a detective novel where the hero does not solve the crime a crime that as it turns out, is totally random. For that, I needed a protagonist who believed totally in reason and order. And yet, he had to be a little cynical and beaten down by the world to the point where the only thing that holds him together is his belief in a rational world. When that belief is challenged, so is he. But to do this, I had to use a familiar archetype, and thus, Swann was born. Of course, as it turned out, the original ending I had for the book has been changed...but the title remained. You've been called genre-twisting Where do you think the modern mystery is going and where do you see the pitfalls? I think the modern mystery is very tough to write today because of all the technological advances. People watch TV shows like CSI and they think that DNA and forensic evidence solves all crimes--this takes away from the individual, and it's part of why I sent my book in the late 1990s. Also, today we have cell phones and email and everyone's constantly in touch, which results in another problem for the mystery writer. For me, the answer might be to write a sequel to Swann that's a detective novel where nobody gets killed, meaning the crime is not deadly. I can probably pull this off because Swann is a finder of lost things, not necessarily a solver of crimes. Can you tell us something about the New York Writers Workshop, which you founded? Does teaching writing help your own work? the New York Writers Workshop was founded seven or eight year ago by a group of writer/teachers who had been teaching at the Writer's Voice. Many of us were disappointed at the way things were going and so we decided to start our own organization that would create a nurturing environment for writers and writing teachers. You've also done some ghostwriting. Do you feel that takes away from your own writing process and requires you to bend to another's voice, or is it liberating in some way? Again, ghostwriting has probably helped me to be a better fiction writer, because it really necessitates taking on someone else's voice and point of view. Sometimes it can be a pain, but it's also really liberating because it allows you to create a voice for another person--rarely, is it really that person's actual voice. If it were, they'd probably be able to write the book themselves. But it has to be a reasonable facsimile, or else it doesn't work at all. My most recent example was The Mad Fisherman, by Charlie Moore. Charlie's a great character and he has a very distinctive voice, which I tried to capture and enhance. And if you're really successful, they actually think it's them. What's your working day like? And what are you working on now? My working day is usually spent trying to avoid writing--and I've become very creative at that--writing and answering email, reading the newspapers, magazines, students' work, seeing movies, meeting friends. But fortunately, when I do sit down to write, I'm able to focus very well and I'm also a very fast typist. I'm working on, or should be working on, a sequel to Swann. It's called Bad Reception and it takes place several years after Swann's Last song. Disillusioned, he's left the skip tracing business and he's working as a cable TV installer--making the connections he wasn't able to totally make in the first book. Of course, he gets sucked back into the biz and his case takes him into the world of rare books. I am thrilled to report that I just found out I made the semi-finals for the Fade-In/Writer's Net Screenplay Competition! I'm really excited because last year I only made it to the quarter finals, and I was certain that was as far as I was going to get this year, too. The script is based on my very first novel, Meeting Rozzy Halfway, which is about two girls growing up in 1960s Boston, and one of them begins to slowly go mad. These are the kinds of things an insecure writer like me needs to push on. Support the International Committee of the Red Cross's activities in the Gaza Strip! Leora Skolkin-Smith and Beverly Gologorsky have organized a group reading to raise funds for medical supplies for the people of Gaza. A partial list of the participants reading that evening include Alix Kates Shulman, Elizabeth Strout, Jan Clausen, Chuck Wachtel, Wesley Brown, Mary Morris, Barbara Schneider and many others. If people want to make contributions before the reading, Leora has assembled the following information. Seemingly, ICRC, has been one of the few to get through with aid. Contact and address information in case people want to send donations in to the Gaza iniative even if they can't make it to the reading -- ICRC is among the few places that can get relief aid into Gaza. I met Jessica Keener online and we quickly became fast friends. One thing led to another and we began reading each other’s books, and I was totally knocked out by her two novels, Love, Death and Hunger, and Night Swim, which are with her agent. Love, Death and Hunger is about expatriots in Hungary, adoption, and a father desperate for justice for his murdered daughter. Night Swim is about a teenaged girl grappling with the legacy of her mother's death while she struggles with coming of age, and both novels are exquisite. Because I was so in love with her books, I asked her if I could pepper her with questions and she graciously agreed. So thanks, Jessica! Did you have an outline for your book Night Swim, or were you writing by the seat of your pants? So far, I’ve never outlined my novels before I write them. Novels for me start with some kind of emotional discomfort that I work out as I write them. The characters and situation are a way of acting out what that discomfort or question or mystery is. Because I don't have a formal outline per say, I like to keep moving forward until I reach the end. I won't know the ending until I get there, and that's part of the fun, though I may have an inkling of where it’s all heading. Things change direction while I’m writing. A new character might appear. One I thought would play a larger role doesn’t or vice versa—a secondary character will demand more attention. Night Swim is effortlessly surprising—How did you get so deeply into the mind of a 14-year-old girl? Fourteen is a poignant, intense age. It’s that time when sexuality is burgeoning and the intellect is vying to keep up with how we are feeling and why. It’s a time I remember well for its intensity both good and bad. I had my first serious crush at that age—I mean, over the cliff, down the chasm crush. At fourteen, we’re nudging against the wall of adulthood, wanting it, not wanting it, etc. I think, in many ways, it’s a terrible time of life but memorable. I’m slow. I plod along. I write daily, almost. I revise constantly. I love to revise. For me, getting that first draft out is the hardest. The next draft is a relief. At least I’ve got a story to work with, characters to refine, and a plot to shape. My newest novel (Love, Death & Hunger) I wrote on a pretty set schedule of 500 words a day, about 5 days a week. That worked out nicely. After a short amount of time the words do add up. But the daily routine kept my head in the novel, which I believe is critical when writing novels otherwise you can lose control or lose your momentum. I try to make my 500 words worthwhile keepers. Some days the 500 words come quickly, other days I sit there amazed that 500 words can take so long to get right. I also use file cards to stay organized. I love file cards! Each character gets a file card, that way I can remember details about them or change the details such as hair color, where the character came from, the relationship of the character to other characters. Also, I write notes in a non-linear fashion—what the problem or issues are in the novel as they arise; whatever comes up that needs “discussing” with myself in the form of notes, I’ll jot them done. One of the things I loved about Love, Death and Hunger was how perfectly you captured the expatriate experience in Hungary. Where does that come from? Have you been there—or been an expat anywhere?Yes. I lived in Budapest for a year and absolutely used my experience there for this novel. I had no idea about the expat community and what it was before living overseas. Like Annie, the character in my novel, I also didn’t want to spend my time in Hungary hanging out with just Americans, though I desperately missed speaking English. Not knowing Hungarian was much harder to live with than I imagined. It made me realize how deeply I rely on language to feel good, alive, part of where I am. What jumpstarted this novel? 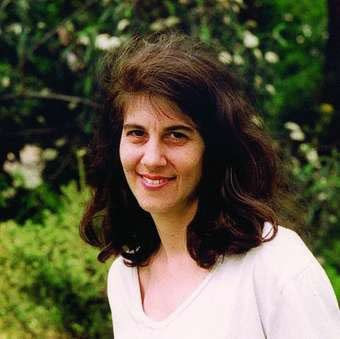 I had a neighbor whose daughter died of mysterious causes, and the thought was that she may have been murdered, but it remained unproven and uncontested. The daughter was buried and the killer, possibly her boyfriend, is living free. This haunted me. I kept wondering what I would do under such a circumstance, so I created this novel as one way to work out my feelings about murder and the loss of a child--a double nightmare--as well as the idea that we don't necessarily know someone the way we think we do and how that can really flip our lives around. I was also fascinated with the relationships—the parents of the adopted boy, and their worrying about the birth mother, the cheating spouses, and the rage of one father toward the man he felt murdered his daughter. Whom do we really belong to and why, seemed to me to be one of the themes stitching the novel together, as well as never knowing the whole story about any one life. So I have to ask you, do you think it’s possible to really know someone? Yes. I do think it’s possible to really know someone. But I think most people are afraid to open up to others and to let others in. All this guardedness creates confusion and mystery, endless misunderstandings and pain. It’s busy. For my day job, I freelance for the Boston Globe Magazines and many home design magazines, plus I read fiction for Agni magazine, a wonderful literary magazine that’s been around for more than 30 years. I work at home, a set-up I love. I’m putting together a proposal for a memoir called Confessions of a Hermit Crab, an intimate story about houses, friends and a writer’s lifelong search for a home. The hermit crab image came to me for several reasons. For one, they move a lot, and so have I. Also, the shape of a hermit crab's abdomen, which is its vital part, is determined by the shape of the shell it inhabits as a juvenile. I thought that was a cool concept that certainly translates to humans--and to me. How do our childhood homes shape our perception of home and what we seek in a home, that sort of thing. What makes us feel at home? Except for my published book, Time to Make the Donuts, which I co-wrote with the founder of Dunkin' Donuts, this is the first time I've written something by outlining it first. I haven't decided whether I like doing it this way or not. Too early to tell, perhaps. I'm also working on a book with novelist MJ Rose. It's called The Business of Being a Writer--not about how to write but how to deal with the business side of writing once you have a book to sell. Are you glad you’ve devoted the past 20 plus years to writing fiction despite the hardships, rejections and demands it has put on your time while juggling paying jobs, plus raising a child? (--And my answer: Yes. But I've gone through dark times, times when I've wanted to give up, questioning myself, wondering if I was insane to keep writing when no one seemed to care. Having pushed through these times, I’ve come to understand that I need to write, and that I want to write novels. These days, I try hard to keep the act of writing protected from these invasions of negative thoughts (comparing myself to others or wondering why I haven’t made more money doing it). The joy of writing is one of the greatest pleasures in my life. Author Masha Hamilton alerted me to an astonishing letter she received. Meena, the author of the letter, went to Kandahar (a long-conservative city and home to the Taliban during Mullah Omar days) to interview the schoolgirls who were attacked in November when radicals threw acid at them. Several girls were disfigured and two blinded in the attack. Here is her note as she sent it to Masha:. I found Kandahar to be very quiet and isolated. According to people, many middle class families have left the province to live in Kabul or emigrate back to Pakistan and Iran. A lot of the people I met were mainly complaining about unemployment and poverty. There were only a few restaurants and hotels in the whole city. According to the natives the only well paid jobs are with the foreign NGOs and many think it is a big risk to take. I was staying in a dormitory along with eight other absolutely adorable girls from Uruzgan and Helmand who were studying to be midwives. Surprisingly all of these girls were Persian speaking Shia citizens of their provinces where they make a very tiny minority. While asking them about the conditions in their home provinces they told me that in Uruzgan Persian speaking people have their won communities, where government has more power and Taliban are not very powerful. The also told me that Pashtuns do not let their daughters to go to school or work that is the reason why majority of the doctors, nurses and teaches are Persian speaking Shias although, in these provinces Pashtuns make the majority. According to the girls they do not even wear a burqa in Helmand and Uruzgan while they are inside their own communities. Nafisa from Helmand told me that her mother runs a special class in her house for the girls who have dropped out of school. The home school is supported by the government so her mother is paid about three and a half thousand Afghani (almost 60 USD) a month. This is a very good income in Helmand. She told me that because the government sometime helps the course students with some wheat and cooking oil, even some very conservative families let their daughters and wives to attend the class. (From this you can see how severe the poverty really is). I was shocked when Sohila and I were stopped to enter a restaurant because we did not have a male relative with us (absolutely like Taliban rules).on the streets you can only see a few women after 12:00 at noon. Almost every woman wears a burqa and sacks to cover their feet. People over all but women especially looked so much scared of the Taliban. They were almost paranoid about it. They thought that Taliban follow each and every of them and can hurt them and their families anytime. Unlike Kabul I did not see many signs of the central government (like our national flag, Posters of the President and etc..). The only photos even in the government owned vehicles I noticed were of the late King, Zaher Shah, and Kandahar’s former governor Gul Agha Sherzoi, who seemed to be very popular. Surprisingly, a majority of the police in Kandahar were Persian speaking (looked to me more from Parwan and Panjshair) with little familiarity to Pashto language and Pashtun culture. While asking why that would be from a Taxi driver and a friend their reply was that the government does not trust Kandaharis because they can be sympathetic to Taliban. I met eleven out of the thirteen girls (the media was wrong about fifteen or sixteen) from the acid attack and their families. All of them had great hatred for Taliban but meanwhile had no faith in their own central government. Asking some Shias about their religious freedom in Kandahar, they were very happy that they were being somewhat treated equally by the central government. Just a very interesting story, one of the men named Naim who had sprayed acid on the girls was not caught by the police but his own mother called the police after watching the news and told them about her suspicions about his son’s involvement in the attack. Naim was tortured and killed in Police custody. Wearing a burqa was a very interesting experience. It was the first time I ever wore a burqa for that long. Just after getting out of the airport , my friend Sohila, who was already wearing a burqa, asked me to wear mine. I did wear mine but I pulled up the front part meaning my face was not covered. The plan was for Mr. Ted to go with a car that our contact from Human Rights commission sent. And for us was to go in a taxi, whose drivers was a family friend to Sohila. We said good bye but suddenly my instincts told me not to trust the driver of the car. Wearing my burqa but not covering my face I ran to stop the car and go in the same car with Mr. Ted. Behind me Sohila was getting mad and shouting “You are not supposed to be running with a burqa on and without covering your face”. But I did. Of course wearing a burqa was uncomfortable but it was easy to deal with. The hardest part for me was that I had to wear a burqa because of fear of the Taliban and men’s injustice in our societies. I was wearing a burqa not because I wanted to but because I had to. Finally I decided that I would not cover my face. And I would deal with whatever might happen. It was not really like Taliban will beat you or something they do not have that much power. But people would stare at you and gave you bad looks. Of course my friend Sohila did not let me do it all the time but whenever she was not there I did it. Once after dropping Sohila home. I got myself a Pepsi and asked the driver to go through Bazar. I uncovered my burqa, relaxed and drunk my Pepsi. Nothing really happened but made me feel much better. During the nights I slept in a room with four other girls. Till late we all would be chatting. These girls were of ages 16 to 18 and some married and two already mothers. In the first night they were shy and quite but the other nights we made really good friends. I asked them about different things in their provinces especially women rights. I was so mad when almost all of them thought it is fine for men to beat their wives and sisters. And the best thing for a Muslims woman is to keep quiet and have patience. I talked a lot to them about women in Islam. They looked so thirsty for information. I told them that If it is fine for Prophet (PBUH) to divorce his wife why not for us, who are nothing but ordinary followers of him. If in the Quran it says that Nekah is Sunnah (Actions Prophet (PBUH) has done and Divorce is Farz (Muslim’s duty if husband and wife are not happy). Then who are we to do the opposite. While talking to them I felt that I would for sure work for women rights all through Afghanistan but especially in Pashtun areas. These girls told me that they are still very lucky to be born as Persian speaking. What would they do if they were Pashtun women? They girls absolutely loved the freedom we have in Kabul. It was just great for them. They had a feeling that they can not do anything. others need to change things for them. For example Nafisa from Helmad told me that “I can not wait for Americans to take out every woman’s burqa in Helmand and Kandahar”. I told her it is only us, Afghan women, who can and who will do this. It taught me something. I wear my Islamic hejab and if Allah willing I will always but I hope every Afghan women would be able to follow their religion based on their own version and personal believes, They will do it because they want to not because they have to. Over all I found Kandaharis to be one of the biggest victims of Taliban. They are very much in need of help. They are poor, illiterate and very easy targets for Taliban to use. I am happy to report that I wrote about how to get published (and no, it's not that easy) for Dame magazine, where I am the book editor! Well, despite the fact that I still am sick and am waiting for the doctor to call, I've had a lovely birthday so far! I got a homemade CD from son and husband featuring performances from just about all family members and it includes all the songs I sing, except without the botched word. My sister had her whole preschool class sing to me over the phone (and the dark green velvet shirt was also very, very cool), a favorite friend from California called, and the phone is just buzzing from other friends, which sure makes a girl feel loved and needed and cheered. Tonight we are off to dinner somewhere and then I am hoping to get some sleep and not cough. And yes, I am now 19. Heh. Well, I FEEL like 19, so doesn't that count for something? You experiment with ways of telling stories in ways that are ingenious and brilliant. Dear Everybody, for example, is told in letters and a few diary entries left behind by your hero This letters are at turns hilarious, heart-scorching and incredibly moving. Why did you write a book in the form of letters? What did it allow you to do that a plain narrative did not? Also the book started out as a story, "Excerpts from the Suicide Letters of Jonathon Bender," which Stephen King nominated as one of the 100 Distinguished Stories of 2006. Was it always part of the novel, or was this nomination a push to create a novel? Dear Everybody started with one short letter: a man apologizing to a woman for standing her up on a date. The man is wondering if they had gone out that night, if maybe his whole life would have been different, better. At first, I didn't know then who was speaking or that it was a suicide letter, but I did have a strong voice and a skewed way of thinking. That one letter led to a rush of about 100 letters--Jonathon, the main character, apologizing to nearly everybody he has ever known--and the novel opened up from there. Writing a mostly epistolary novel allowed me to deal with difficult material that might have become sentimental if handled as ordinary narrative Another reason that I wrote in the form of letters is that it allowed me to put huge amounts of story into the novel. Each letter is its own story. Each letter evokes more descriptive content, more emotional content, and more narrative content than what is there on the surface. There is so much implication that becomes part of the novel and that accumulates through the novel. That story that was short-listed was always part of the novel. I have never really written short stories, so I have to cut things up if I am going to publish between novels. I heard that you left New York for Baltimore and haven't looked back. How is Baltimore a better place for you to be a writer? And why wasn't New York good for you? It's not that New York wasn't good for me. It was. It was where I became the adult version of myself and found my way as a writer. But writing was always a struggle during my time in NYC. And since my time in Baltimore, writing and I have come to a new understanding. Also, Baltimore has an unbelievable number of writers and artists and musicians working here. This community is incredibly open, generous, supportive. It's a wonderful place to do whatever it is that you do. 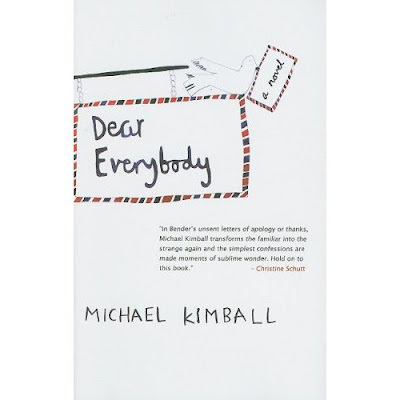 Can you talk a bit about Michael Kimball Writes Your Life Story on a Postcard? This started when my friend Adam Robinson, who was the curator for a performance art festival, asked me if I wanted to participate. I asked him what he thought a writer could do as a performance and we made some jokes about that. But then I remembered these promotional postcards that I had for Dear Everybody and I suggested that I could write people's life stories for them. That's how the project started. I thought it would be fun and funny and that I would ask a few questions and write on the backs of a few postcards and that would be it. The first postcard I wrote was for Bart O'Reilly, a painter, who quit art school in Dublin to work as an ice cream man in Ocean City, MD-which is how he met the woman who became his wife. When I finished writing the postcard and looked up, a line had formed. For the rest of the night, I interviewed dozens of people and wrote each person's life story on the back of the postcard. I did this for four hours straight without getting up out of the chair that I was sitting in. I was completely exhausted by the end. My mind was racing with the details of people's lives and the hope that I had done their various stories justice in the space of a postcard. I was astounded by what people told me, the secrets and the difficulties, the pain and wonder and hope that they revealed. People told me about being in jail, about having too many boyfriends, about suicide attempts, about computer hacking, about communicating with the dead or with aliens. The life story project tapped into something I hadn't expected. I was struck by how earnest and forthcoming most people were, how eager they were to share their life stories, how grateful they were for their postcard. People sometimes ask me how I get people to tell me the things I write about them, but there's no real trick to it. I just ask questions. One thing I learned so far: Everybody is amazing. Can you talk about your documentary, I Will Smash You? I'm making this with Luca Dipierro and Black Arrow Studio. We asked people to choose an object that had some personal meaning for them and then to destroy it in any way that they wished--an idea that grew out of the trailer for Dear Everybody. I interviewed each person about their object, the story behind it, though I was off to the side, off-camera the whole time, just a voice asking questions. Then we let each person do whatever he or she needed to do with the object they brought with them. In the trailer, Adam's troubled relationship with Christianity leads him to sing a favorite hymn and then take a baseball bat to the notes that are in the air around him. Then you see Ella walking down the alley behind my house with a paper mache version of her mean teacher's head. And then there is a glimpse of Betsy working over the windshield of her Ford Taurus, which was cursed. There are some 20 different chapters like that. So what's your usual working day like-and what is obsessing you these days? I always work on my own work first, whatever that is, a novel I'm working on, the postcard life stories, any of that. Then I join the rest of the world-answering email, phone messages, all that. Then I edit somebody else's writing for a few hours. Recently I've been overwhelmed with the life stories of other people. I'm working through a pretty big backlog of requests for the life story project as I figure out what my next big project will be. You should have asked me what my next novel is going to be about. I wouldn't have been able to tell you, but I would have made something up. 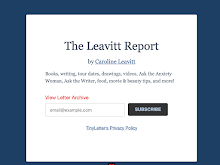 Those essays involving eating disorders, including Caroline Leavitt’s moving account, are thoughtful and well-written. I loved getting a shout-out and I owe the reviewer deep thanks for such a kind review. Now I want to go write and write and write. That said, I spent the last few years writing a novel (which will be out in 2010 from Algonquin) and one of the characters is a boy who has asthma. I spent my childhood battling asthma. We had to give away our beloved cat, Elvis, which upset me so much I wound up in the hospital! I was in and out of hospitals and ERs through my childhood and my teens, and so fiercely ashamed of having the disease that I hid it as best I could. I told people I had a "lung infection", which had more of a je ne sais quoi sound to it than asthma, which actually means pretty in Japanese, I am told. I hid my inhalers, once even elaborately tying it around my waist under my dress so no one would see. Asthma was an old man's disease, a joke where you were the punch line. I almost suffocated rather than let my first boyfriend see me wheeze. I refused to admit the disease to myself. Then I got pregnant. My asthma got better! I began to think more about it and to write about it and to create this peripheral character I just fell in love with, this sturdy, edgy little boy who has asthma. And the more I wrote about him, the better I felt. It was magic thinking--I know that. Surely writing about a boy suffering asthma attacks is not going to make mine go away. But, the thing is. It did. It really did. The more I wrote, the more my lungs seemed to widen. I got a new pulmonologist who told me that my lung function tests were so good, I was nearly normal. He even suggested that I could go off all my meds! Slowly, I got rid of the pills that made my heart jump. Then I stopped using the rescue medicine which opens your lungs the way a crazy person flings open a closet door, hard, so the wood cracks. Down to one medicine! Imagine! Being able to run outside without an inhaler, without pills, without worry. Sleeping through the night and waking up, bounding out of bed. This went on for two years, making me wonder if I should write about another problem I might have to heal it. And then I got sick this week and the asthma came back. I'm sad. And disheartened. And sick. I know this is the path of asthma. It comes, it goes, you can grow out of it and into it and no one really knows how to cure it. But for two blissful years, I thought I had. Ugh, being sick is no fun, but we did stay up last night watching the Twilight Zone Marathon, followed by the Honeymooner's Marathon, which gave birth to an illness dream. I think something has unlocked within me, because this particular dream has always been a recurring dream (too personal to go into) but instead of ending the way it always does, it ended this time with me empowered! It's gray and cold outside, I'm writing and thinking of cooking (homemade bread and soup) and I have to admit I have a really good feeling about this year. My sister just gave me this amazing gift. This exquisite handmade necklace with these tiny sterling silver circles with the name of Jeff and Max etched in the center, so I can wear them close to me all day long. A perfect gift from a perfect sister and a constant reminder how lucky I feel and how very, very grateful.